How I Setup My Home Office And You Can Too! I've been working from home for over 10 years and I've setup a few home offices along the way. I started working from home part time. With at least an hour commute each way, it was nice to work from home a couple of days a week. Back then my home office was pretty simple, the kitchen table. I've since evolved to a full office in a dedicated room. 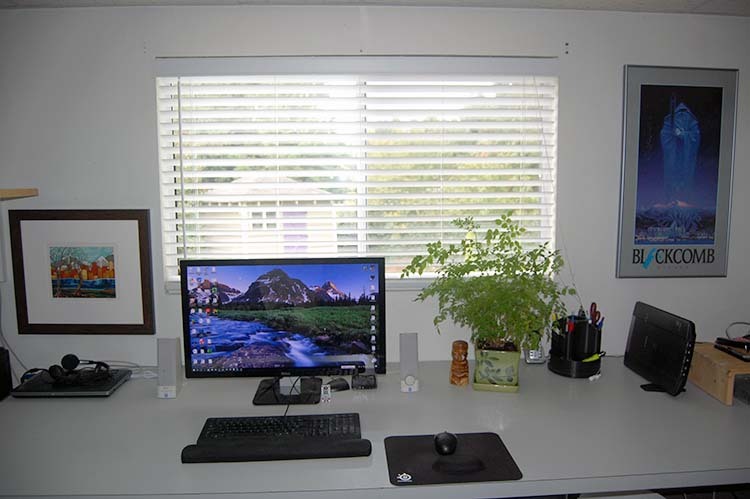 In this article I will discuss how to setup a home office in any available space. My first home office wasn't a full office and more of a remote office. I was considering working from home and I wanted to see what it would be like. Could I get my work done? Would I miss the support and the communications in the office? Initially, it was more of a temporary office and as I mentioned earlier I worked at our kitchen table. And it was missing some things you usually find in at a company office like a printer or photocopier. This was okay, because it was not a long term solution and I was still going into the main office 2 to 3 days a week. I also liked this idea because I was considering this option and it wasn't a lot of expense to setup. So a good option if you are considering working from home and you want to do a test run. It's also easy to setup if you need to work from home in an emergency. Working from home is not for everyone. You need to be disciplined to get all of your work done. Sure you can get up for a stretch to start a load of laundry, but you can't do all of your housework and make dinner. I enjoyed working from home and after 6 months I got an Ikea table and chair and setup my office in our bedroom. With a dedicated works space I was able to setup a more permanent spot to work. I now had a place for a printer, monitor and keyboard. No longer did I have to cleanup my work stuff off the kitchen table when it was time for dinner. The one downside to the office in the bedroom was printing documents at 1 in the morning. My wife wasn't too happy about this. But besides this it was a nice location during the day. Quiet and no distractions. My 2nd Home Office – A Walk-in Closet? After a year it was time to upgrade my office again and make something more permanent. To setup my next home office, I converted our walk-in closet into a small work space. Since it had a door and a light and I could work as late as necessary. I removed the wardrobes and installed custom desks and shelves using MDF melamine. MDF is inexpensive, easy to work with, and has a nice finish. To make it functional I had someone install a few power outlets. I also had the same person install a small window on the exterior wall to provide natural light and fresh air. The window was the most expensive part of this renovation, but it was worth it. The nice thing about building my small office was that I could customize it. There was a small alcove that nicely fit a filing cabinet and then I made shelves above it. Lots of room for books, binders, and a dedicated shelf for all my electronics: printer, cable modem etc. Of course without the walk-in closet we didn't have a space to hang our clothes. We purchased an antique wardrobe that was originally from the Netherlands. It was neat because it was designed to come apart to be moved up the narrow stairs in the Netherlands and re-assembed. It was a lot smaller than our walk-in closet, but we survived. Sometimes you need to make sacrifices to leave the life you want. My third and present home office is a bedroom in our basement. We have a walkout basement so the room a big window with lots of light. When we moved into our new house there was extra space in the basement and I was able to takeover an entire bedroom. It already had power, lights and a window. This is best home office I've setup and it has lots of room. I had a nice big bedroom to work with and had lots of room for a desk, cabinets. etc. At the same time we moved into our house a friends business was renovating their new office and they had some custom built desks they didn't need. With a saw, screw driver and a little work, I was able to remove the desk and install it in my new office. That was over ten years ago and I'm still using the same desk. I turned the bedroom closet into a nice area for books, papers and office stationary. I took the closet doors off for easy access and removed the hanging clothes rod and installed a bunch of shelves. As I was writing this article at my alternate remote office, aka coffee shop, the DHL guy that delivers packages to my home office walked in. Which reminded me I should discuss other services you may need from time to time. When you are working from home you don't have a mail room or a shipping person you can lean on for support. If you ship or receive packages this is something you will have to learn to do on your own. I usually ship and receive one to two packages a month. I've thought about setting up UPS or Fedex account, but I never felt I shipped enough stuff to worry about it. To ship packages I go to the local UPS store. Which gives me an excuse to get out of the home office. I've found the local UPS store staff very knowledgeable, competent, and no any issues shipping things. I even had them call me back once because they realized they charged me too much. How nice is that. Receiving items at home can sometimes be a pain. My office is in the basement an I don't always hear the door bell. Luckily most couriers will leave items at the door unless they require a signature. But it is still a pain to have to be waiting for a delivery to show up. And I'm continually checking the courier tracking information to see if the package has arrived. For awhile I had a mailing address at the local UPS office. This was pretty handy. They will receive regular mail and packages. When a package is delivered they will call you. It also gave me a business mailing address I could use instead of my home office. I don't remember the price, but decided it wasn't worth it and canceled it after the first year. But something to consider if you receive a lot of packages or want a business mailing address, besides your home address. If you have a friend that has an office you might be able to use their mail address and have packages shipped there. I don't like a cluttered work space, but it's nice to have a plant or two and some personal touches. Plants are great to provide fresh oxygen and it's nice to bring the green outdoors inside. I purchased the plant in the picture at Home Depot for about $10 and paid another $5 for the pot. When you purchase a new plant you usually want to replant it to give the roots room to grow, so a new larger pot is a good idea. And another way to bring more color into your office space. For more suggestions on plants that are good for the office and pictures of the plants I listed above check out the Small Biz Trends website: 20 indoor plants for your office environment. It's also nice to have a few pictures on the office wall to make it feel personal. I also have the required whiteboard and a map. I got the map from Cracker Barrel years ago and it's handy when planning or trip or finding out where someone is located when I'm talking to them on the phone. I hope this article give you a few ideas on how to setup a home office. And how you can get started with little expense. Please use the contact form on the site if you have any ideas or comments on setting up a home office. I use to allow comments on my posts, but I was getting too much spam. If you are thinking about getting a new printer, please read my article on upgrading my Epson printer.